A prince, who should enact a certain proportion of his taxes be paid in a paper money of a certain kind, might thereby give a certain value to this paper money. The only part of the so-called national wealth that actually enters into the collective possessions of modern peoples is–their national debt. Hence as a necessary consequence, the modern doctrine that a nation becomes the richer the more deeply it is in debt. Public credit becomes the credo of capital. And with the rise of national debt-making, want of faith in the national debt takes the place of the blasphemy against the Holy Ghost, which may not be forgiven. From these two quotes, the primary difference between the Metallists and Chartalists approaches to understanding money is revealed. Money is not a commodity. Money is, in the words of the legal scholar Friedrich Knapp, a creature of the state. What may seem to be a subtle difference is in reality substantial. The reorientation of money as a state phenomenon, rather than a market solution to the double coincidence of wants requires a completely different framework for analyzing the economy. The economy can no longer be modeled as a barter system. Real analysis fails to capture the complexity of money, and thus even the existence of general equilibrium itself is called into question. Returning to Schumpeter, if the modus operandi of money is not simply a facilitator role, then we must conduct monetary analysis. Simply put, this requires the abandonment “of the idea that all essential features of economic life can be represented by a barter-economy model” (Schumpeter 1954). We can begin to appreciate the difference between the analysis of a barter system and a money economy by applying Marx’s notation and modeling of the circuit of money capital. This notation is simple and straightforward (see also Chapter 16: “The Megacorp”). where the first stage M – C is termed purchase and is followed by the production process P culminating with C’ – M’ sale. This analysis of the economy is a monetary analysis. Returning to the barter notation, from above, the transaction would look like this. Note, there is no C’ in this exchange. This is because the value is generated, not by production or labor, but through the act of exchange. Remember, in the barter economy of the neoclassical school, trade does not occur unless both parties benefit. Value is created through the exchange process and relative prices become the measure of those values (this is also described in Chapter 3 On Values). Where in Marx’s model, value is created through the production process and comes from labor. As you can see, the interpretation of how the economy operates is very different. The predictions of outcomes from market activity are also at odds. In the real analysis of neoclassical economics, markets trend towards equilibrium. Real analysis predicts a stable solution where quantity demanded is equal to the quantity supplied. However, if the economy is investigated from the monetary analysis perspective, simple solutions do not immediately present themselves, as conflict, business cycles, and crisis are all consistently observed in capitalist economies and central topics of analysis in Marx’s theoretical framework. This is one reason why John Maynard Keynes considered his approach to understanding the economy as The General Theory of Employment, Interest, and Money. Similar to Marx, although Keynes denies any Marxian influence, Keynes moves his analysis of the economy beyond the barter system and real analysis and attempts to understand the dynamics of a monetary production economy. For Keynes, in a monetary production economy, there is no reason to assume the economy will trend towards full employment equilibrium in the labor market. In fact, given the special properties of money, the economy is more than capable of coming to rest, for long periods of time, at a level of output far below what is necessary to achieve full employment. Keynes argues that money has two special properties that differentiate it from all other commodities in the economy. The first is that money has a near zero elasticity of production. This means that, while it might be reasonable to argue that a problem in our local economy is that there is a shortage of money, we cannot go into the business of selling money. So unlike wheat, milk, cars, tables, or any other good or service, as entrepreneurs, we cannot address the unmet demand for money by producing it ourselves. The second of these properties is a near zero elasticity of substitution. This property relates to the use of money as a means of payment. The state and most private vendors will only accept dollars (in the United States) as means of payment to satisfy debt obligations. Wow, that is a mouthful, but it simply means that there are very few substitutes for money as a method of payment. The IRS will not take your laptop as a payment for your taxes. The gas company is not interested in your tee shirts to satisfy your bill, they will only accept one thing: cash. As the Wu-Tang Clan so succinctly puts it, C.R.E.A.M. cash rules everything around me…. dollar dollar bill y’all. These two special characteristics of money influence a monetary production economy, by incorporating two missing pieces from the real analysis approach of neoclassical economics, uncertainty and the state. Hence, it is a more “general theory.” Let’s discuss the state first and then provide a brief discussion of uncertainty. Why can’t we produce dollars? Well this is against the law. 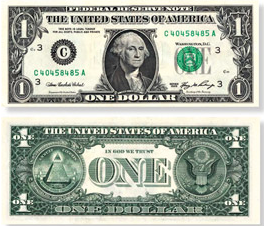 By law, the Treasury Department is the only producer of new U.S. dollars. We will elaborate on this in detail in the next section. Second, why won’t the state take my laptop? For this let’s take a moment to look at the dollar (Figure 1 above). Up in the upper left corner it says “THIS NOTE IS LEGAL TENDER FOR ALL DEBTS, PUBLIC AND PRIVATE”. This means that there is no reason for the state to accept anything else in payment. If you believe that your laptop is of sufficient value to cover your tax obligation, then you must first convert it into cash to pay your tax bill, and this introduces an important concept in Keynes’s monetary framework, liquidity. Liquidity is a measure of the costs associated with converting an asset into cash. For example, your savings account is an asset. It is very liquid, but to convert it into cash you need to go to the bank and withdraw the funds. This time and effort is a cost, but these costs are relatively low. An example of an asset that is not generally described as being liquid is a home. The sale and conversion of a home into cash is a time consuming and often-expensive process. An asset’s liquidity is of great importance for understanding economic volatility and how risk and uncertainty differ. own rate = q – c + l.
Returning to the example of a home, the expected return, pre-housing crisis, was strong, based on historical data. A home’s carrying costs are not cheap. Maintenance, mortgage payments, property taxes, etc. all push up the carrying costs, but you get to live there and conventional wisdom said that a homes value always increases. The final component is its liquidity premium, which is also related to the expected return. A house in a sellers’ market in a good neighborhood might sell quickly, whereas a home next to a newly constructed slaughterhouse might not be so easy to unload. Thus, people’s view towards the future plays a critical role in determining the own rate. If the housing market is strong, then it is easy to sell because the expected return is positive and the future seller does not think selling in the future has much risk either. On the other hand, if the market is doing poorly, then expected return is going down, carrying costs might be increasing, as pickier buyers are demanding more and more repairs, and the liquidity premium is disappearing, as a buyer cannot be found. This equation can be applied to all sorts of commodities. Give it a try in the exercise section below. Think about a car, stocks and bonds, or a record collection. These assets all change in own rate based on expectations of the future and how quickly they can be converted into cash. Because it is more difficult to convert assets into cash when markets are unstable and uncertain, people tend to hold onto the one asset that is not negatively impacted. You guessed it: money. The saving money by individual in times of uncertainty is problematic for the economy. Keynes argues that this virtuous behavior, from the classical economic perspective, aggregates to difficulties for the macro economy as a whole. If you are saving, then, yes, this practice can be beneficial for you, but if we are all saving, then we are not spending and this sends negative signals to investors and business owners. So while individual savings is good, the aggregation of this positive behavior generates adverse economic conditions as a whole. This problem is known as the Paradox of Thrift. This paradox creates difficulties for the neoclassical argument that the aggregation of optimal decisions aggregates to a stable and harmonious society or equilibrium conditions. If we return to Adam Smith’s comments above, we can add the contributions by Marx and Keynes to complete the basic framework for understanding money, not as a commodity in a barter system, but as a social relation in a modern capitalist economy. Remember, the value of money in the Metallist’s story is derived intrinsically by a precious metal, but Adam Smith seems to be suggesting that value can be generated by the actions of the Prince. This is a prescient observation by Smith, as modern fiat currencies maintain the value by generating demand through the implementation of a tax or other obligation to the money issuing authority. Therefore, an historical and institutional approach to investigating money reveals fundamentally different dynamics and explanations of the operations of the modern economy. From this interdisciplinary perspective: all economic activity is observed to begin and end with money, money plays this central role because it has special properties, and an authority, such as the state, is responsible for maintaining their currency’s value. By breaking free from the methodological constraints of real analysis, Modern Monetary Theory (MMT) is able to provide insights into economic activity where money serves as more than a contributor to the modus operandi in support of barter. In the next section, money is investigated as a social relation. This social relation can be described as a two-sided balance sheet operation. These relations of credits and debits are ordered in the modern economy by a hierarchical structure. As this institutional structure is outlined below, the coordinating function of money and its role in determining value becomes clear. For those looking for an accessible way to introduce themselves to Adam Smith’s vast opus, Robert Heilbroner’s The Essential Adam Smith is an excellent resource. Some may be already familiar with his text The Worldly Philosophers. This insight is drawn from Capital Vol. I.